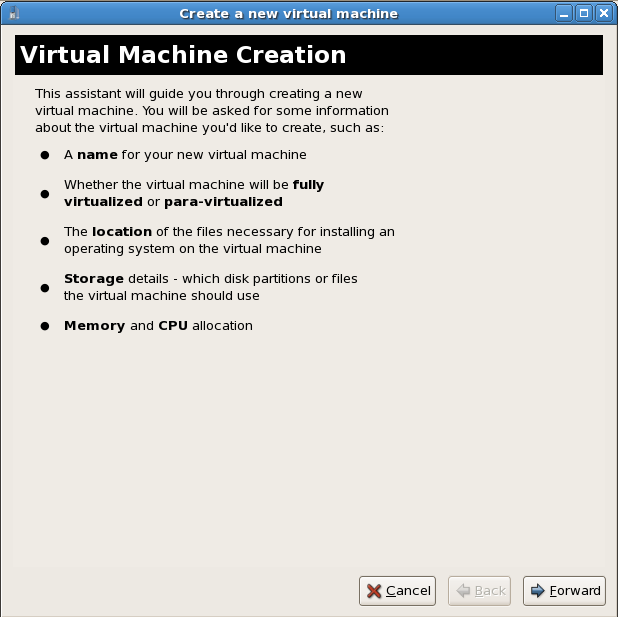 This section covers installing a fully virtualized Red Hat Enterprise Linux 5 guest. 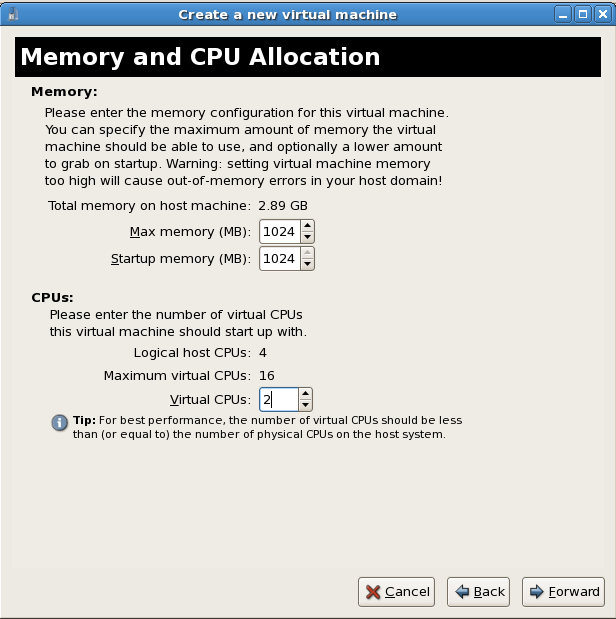 This procedure covers both the KVM and the Xen hypervisors; the steps are interchangeable and different steps are noted. Connect to a hypervisor if you have not already done so. Open the File menu and select the Add Connection... option. See Section 27.1, “The Add Connection window”. 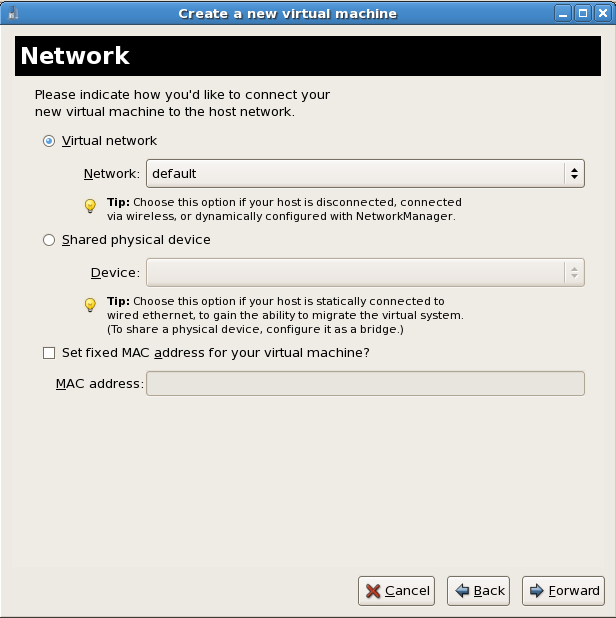 Once a hypervisor connection is selected the New button becomes available. Press the New button. 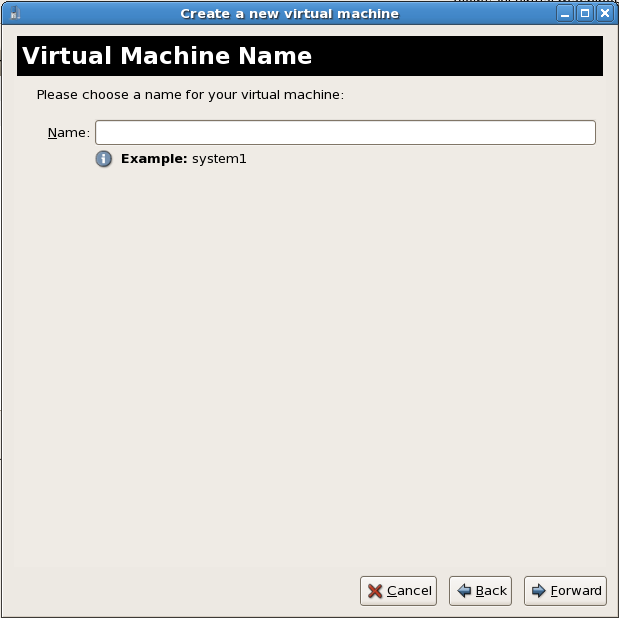 Choose the virtualization method for the guest. 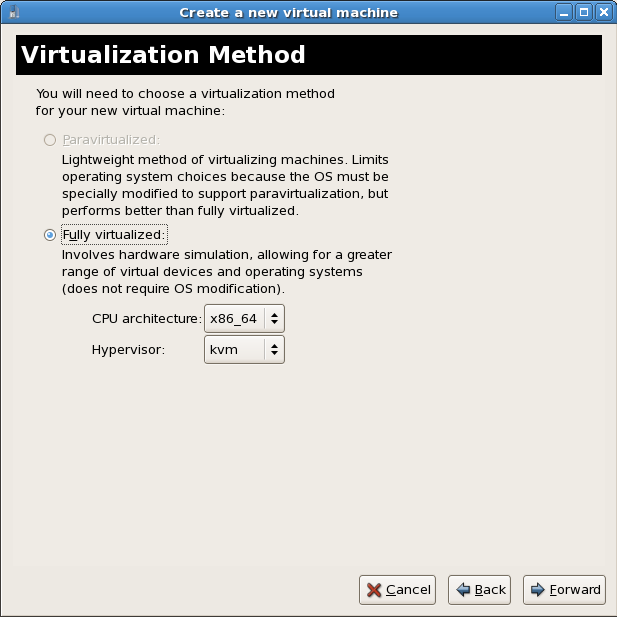 Note you can only select an installed virtualization method. If you selected KVM or Xen earlier (Step 4) you must use the hypervisor you selected. This example uses the KVM hypervisor. local install media, either an ISO image or physical optical media. Select Network install tree if you have the installation tree for Red Hat Enterprise Linux hosted somewhere on your network via HTTP, FTP or NFS. PXE can be used if you have a PXE server configured for booting Red Hat Enterprise Linux installation media. Configuring a sever to PXE boot a Red Hat Enterprise Linux installation is not covered by this guide. However, most of the installation steps are the same after the media boots. 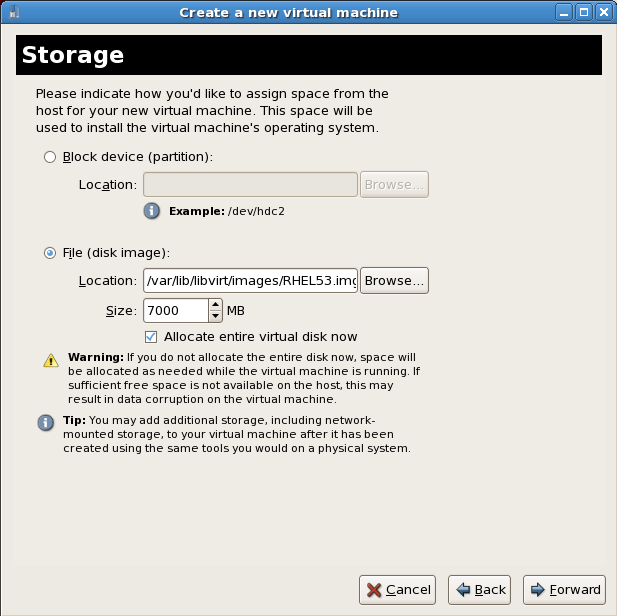 Set OS Type to Linux and OS Variant to Red Hat Enterprise Linux 5 as shown in the screenshot. Select ISO image location or CD-ROM or DVD device. 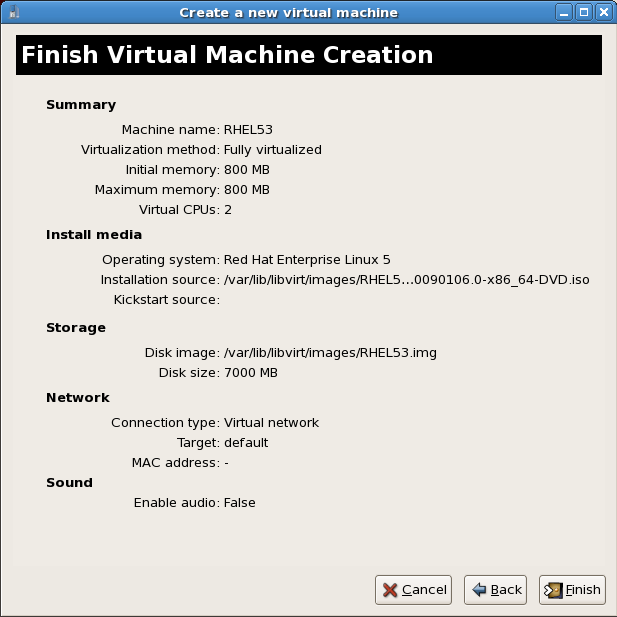 This example uses an ISO file image of the Red Hat Enterprise Linux installation DVD. Search to the location of the ISO file and select the ISO image. Press Open to confirm your selection. For ISO image files and guest storage images the recommended directory is /var/lib/libvirt/images/. Any other location may require additional configuration for SELinux, see Section 19.2, “SELinux and virtualization” for details. Live and offline migrations require guests to be installed on shared network storage. For information on setting up shared storage for guests see Part V, “Virtualization Storage Topics”. 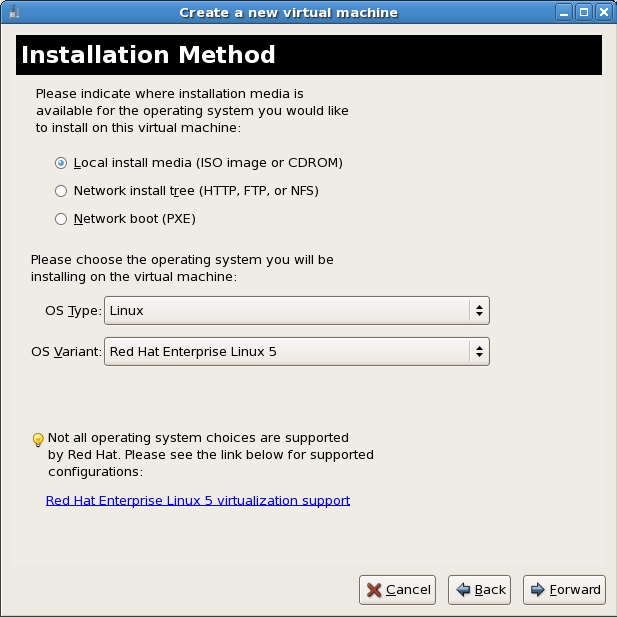 Complete the Red Hat Enterprise Linux 5 installation sequence. The installation sequence is covered by the Installation Guide, see Red Hat Documentation for the Red Hat Enterprise Linux Installation Guide. A fully virtualized Red Hat Enterprise Linux 5 Guest is now installed.